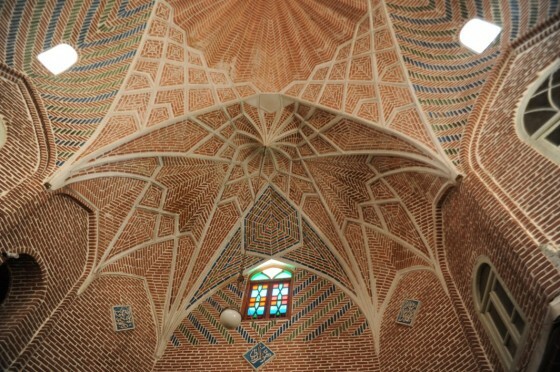 Organically composed of interconnected structures, with a maze of corridors and vast interior, Tabriz Bazaar is both straightforward and complex. For centuries, its nooks and crannies and open space set a public stage for retail therapy, social meetups, and politics. Maybe you’ve seen the world’s biggest bazaars? There’s Istanbul’s labyrinthine Grand Bazaar, Europe’s most-visited attraction with15 million annual shoppers; Cairo’s Khan el-Khalil, which put a stranglehold on the Medieval spice trade, inciting Columbus to go sailing; and Tehran’s Grand Bazaar, where conservative and pro-Khomeini bazaaris (shop owners) organized to help finance the Islamic Revolution. So what makes this one stand out? 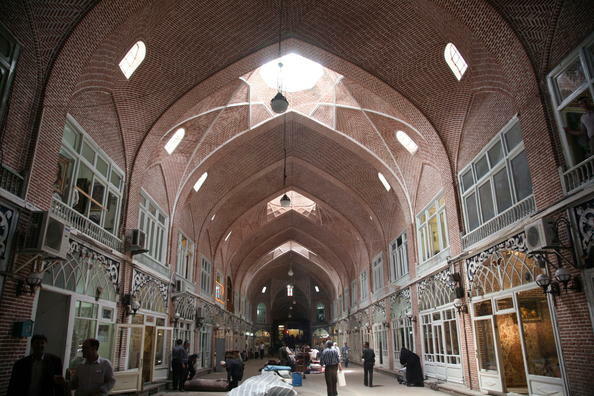 Tabriz Historic Bazaar has been rocking cultural exchange and commerce for millennia. Pin its staying power on location: it’s smack central on the old Silk Road, antiquity’s busiest trade route. Moroccan explorer Ibn Buttata visited and raved about the beautiful slaves who modeled jewelry to the wives of rich Turks. Marco Polo was a repeat customer. Tabriz, an ancient city with Bronze Age origins, is capital of the East Azerbaijan province of Iran. Its history is fascinating: an important 9th century military base and twice capital of Azarbin, it evolved into a desirable zip code for 14th century artists and philosophers. In the run-up to the 1600s, manufacturing grew and diversified (weaving, metallurgy, weapon and tile production, leatherworks and soapmaking) and trade expanded. The city had rough patches. It was sacked by Tamerlane, then by the Iranians, Ottomans and Russians. Even Mother Nature took a turn, sending in earthquakes and floods. 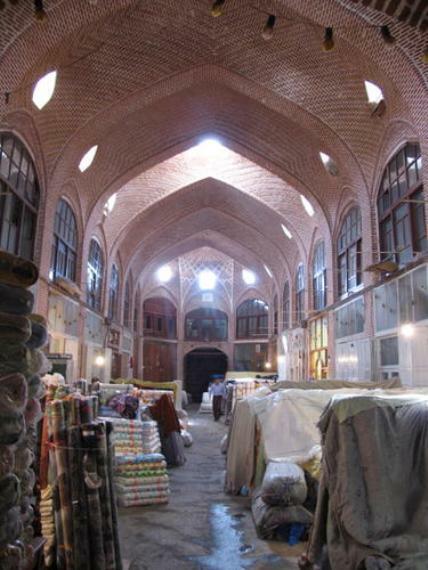 Through it all, the bazaar remained an enduring commercial and economic center fro Tabriz and northwestern Iran. The building bears history’s scars. Its last reconstruction followed a devastating earthquake in 1780. In 1975, it became officially protected by the Iranian Cultural Heritage, Handicraft and Tourism Organization, which oversees protected monuments. Tenants then undertook minor rehabilitation via a smart policy of endowments and tax exemptions. In 2010, it was added to the UNESCO World Heritage List. The spectacular brick structure covers about 67 acres with almost 4 miles of covered shops and product-specific “sub-bazaars” for gold, carpets, shoes and food. It’s used for important Islamic holidays, like the Day of Ashura when merchants cease trading for about 10 days and the bazaar hosts religious ceremonies. It’s increasingly rare in the Middle East for urban development to cast heritage in a catalyst role. Rather than abandon the bazaar in pursuit of a modern market, or cringe-inducing mixed-use “lifestyle destination”, the people behind this project elected to rejuvenate Tabriz by preserving its history. Tabriz Bazaar developed over the centuries, remaining true to it’s core function as an economic, social, political, and religious complex where different activities and cultures are integrated in a unique living environment. 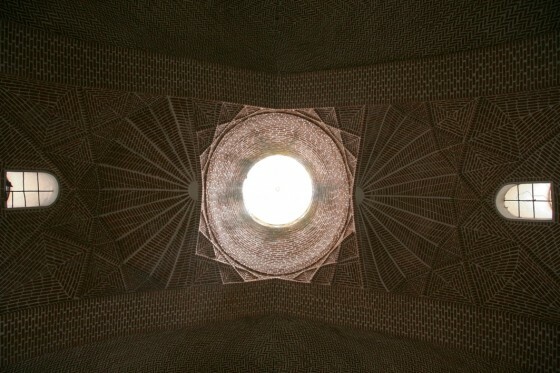 Kudos to this project from keeping Iran’s storied past fit for present purpose.